The WTVC6330US is a 6.7 cu. feet capacity dryer that comes with a number of useful and intuitive features for quick and efficient drying. It can perform quick and effective drying of clothes and other types of load because of its smart features and efficient drying system. See the list of key features below as well as some consumer feedback. - The machine?s EcoSmart technology is composed of an intelligent network of sensors that is responsible for quick and effective drying without the risk of damaging the fabric. - The EcoAction option reduces the amount of energy and water used by up to 10%. - The Air Fluff/no Heat drying cycle dries your clothes without any heat, reducing the risk of damaging clothes. - The DynamicDry feature gently dries the clothes with moderate heat and high air volume in a stainless steel drum. - The stainless steel drum lets you use faster spin cycles, which you cannot do with plastic or porcelain drums. - The Steam Wrinkle Relax cycle removes wrinkles from the laundry in as short as 12 minutes. - The Steam Touch Up feature refreshes a full load in just 20 minutes. - There?s the Wrinkle-Block Tumbling feature that prevents wrinkles by tumbling the load up to one hour. - Heat sensors in the unit prevent overheating. - The Delicates option allows you to wash delicate fabric types with the utmost care. - The 3-way venting system allows for easy installation, allowing you to install the ventilation from the back, bottom, or the right side. - The reversible door and the stackable design allows you to save on space. - The lint filter indicator will tell you if the lint needs cleaning so you can prevent clogs by regularly cleaning the lint filter. - You can look at the controls and settings at the clear LED display on the machine. The machine is known for its quiet operation and for its compact design. The compact design allows you to save up on space and to place the unit in small laundry rooms without worrying about where to put the dryer. You can simply stack it up over the washer. The front-loading design makes loading and unloading very easy. Another advantage is the lint filter indicator that informs you when the lint filter is full, preventing clogged ducts and vents. The machine also comes with an audible signal that you can adjust according to the volume that is most comfortable for you. The machine does a good job at drying clothes quickly and effectively. It has great options for fabric care and reducing odor on clothes. One of the main disadvantages to this machine is the noise. It does have a noise reduction feature but the vibration is still loud enough to be heard in the next room. Padding the bottom with a soft material will help lessen the noise. Another common complaint is the LED display, which is the first to break down in most units. When the display breaks down, you cannot see the settings or the electronic controls. 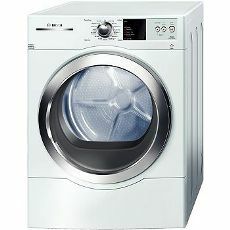 Comments for Bosch WTVC6330US White Vision series electric dryer 6.7 cu. ft. Sheets and clothes tumble into a ball. Had the same problem with sheets. FIX: Two Dryer balls purchased from Wallgreens. Makes all clothes look better. I've had this dryer for a year and a half. My biggest complaint is when drying sheets, blankets or mattress pads, they within minutes end up in a cocoon-like ball, so every few minutes I have to go in and shake them out and they never dry evenly. I've tried putting tennis balls in with the load but that doesn't solve the problem either. There also seems to be no low heat setting, even when using the delicate button. Needless to say I'm not very pleased with this dryer.